Wake up at dawn to the lapping of the waves and the smell of freshly brewed coffee, which is available with pastries in the dining room. Join the Tai Chi morning class on the sun deck which is a unique experience. By following the moves of our instructor you merge with the surrounding scenery. By tender boat we transfer to our day boat named “Sunset”. 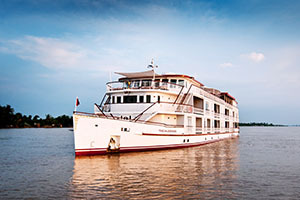 It is a cozy, smaller vessel on which we will discover the hidden charms of Halong Bay. Breakfast is served as Sunset sails for the Surprise Cave, in Vietnamese “Sung Sot”. Sung Sot is the biggest cave in Halong Bay with over 10,000 square meters. It is a magnificent site with the most beautiful stalagmites and stalactites. The further you go inside, the bigger it gets. We explore this natural sensation for about 60 minutes. Once back on the Sunset ship, take some time to simply relax. Lean back on your sunbed while Sunset smoothly sails further into the Bay. 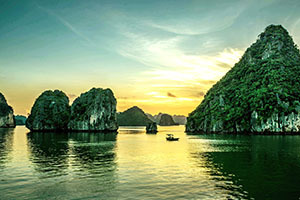 Here you have the chance for another close encounter with the fairy like Halong Bay. Via kayak you can paddle through this bizarre water landscape. The cliffs stretch vertically out of the water and you feel a sense of freedom meandering through this green medley of water and tree topped islets. Back on board lunch is served in the restaurant. Sunset continues the journey to a floating pearl farm. 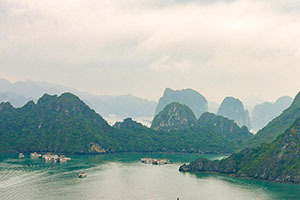 Halong Bay is also a place where pearls are cultivated. In a small factory we learn how pearls are harvested and processed. After the visit, we leisurely sail back to the mothership. Back “home” you have time for spa treatments or sunbathing while we sail to the spot. Dinner is served in the dinning room around seven o’clock. Before you retrieve to your cabin, you might like to have some fun squid fishing with our crew, or simply lean back on one of the loungers and listen to serenity of Halong Bay. Overnight in the cruise. For early risers (around 6:30 am) tea, coffee and pastries are available in the dinning room. A Tai Chi class is offered on the sun deck to ease your mind and muscles. The boat continues to sail to Ti Top Island. We head by tender to this little landmass in the Bay. Prepare yourself for a refreshing morning swim on a sandy beach beneath high rock formations. If you prefer to be more active climb up to the hill to the top of Ti Top Island from where you have stunning views over Halong Bay. It takes 400 stone steps up and about 20 minutes to the top, minimal fitness and proper footwear is required. There is also a viewing platform about half-way up with great panoramic views. Back on board (around 8:45 am) you may like to shower and freshen up. Now it is time to enjoy the last sailing time back to the harbor. A full breakfast is served in the dining room. Relax on the sun deck or in the dining room while savoring the last cruise moments of this iconic site before arriving back on shore. Our crew bids a fond farewell and helps with your belongings. Heritage Line and all the crew members thank you very much for having you on board. Meet our awaiting bus then transfers directly to your hotel in Hanoi. 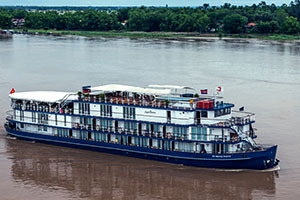 Accommodation, daily (group) shore-excursions as mentioned in the program, entrance fees, transportation as mentioned in the program, tour guide services (English speaking), taxes, fuel, river pilots, local anchorage and port fee, round trip transfer from/back to Hanoi (shuttle bus), breakfast (brunch), lunch, dinner, welcome drink, Tai Chi morning class, insurance (passenger liability), kayaking, drinking water in cabin & during excursion, gym & sauna (in Violet Cruise Only). 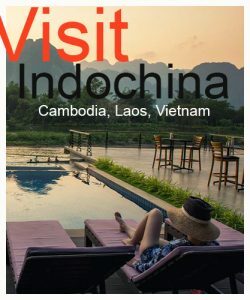 Crew and guide gratuities, any visa fees, private road and boat transfers, personal expenses/purchases, additional beverages, other services not mentioned in program or under inclusion, fuel surcharges (please refer to terms & conditions), medical services, spa treatment and telephone.